Innovation is the quickest, most effective, and most lucrative path to success. Waiting for some other firm to introduce a product first and then playing catch-up may be fine if you are IBM or Coca-Cola and can afford to wait. But such companies are notable exceptions in the game of competition. For the majority of organizations, real success comes from their own efforts and from timing – their ability to be there first, not from feeding off the ideas of others. 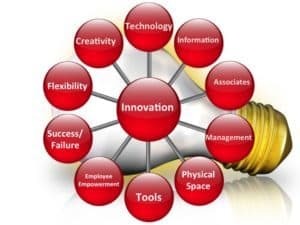 So how does your organization innovate and think creatively? First, understand that creativity isn’t always about inventing products or services from scratch. Thousands of successful products or services are used in a radically different manner than originally intended; the creativity is in the new method of application rather than in the unique nature of the original concept. For example, a creative solution may take the form of redirecting your excess capacity or processes to support your most profitable products or services. Thus, innovation is any creative solution people can use. Innovation is also, how we make money from creativity – we sell the idea and show others how to apply it to solve a variety of problems. Solutions may be possible, but are they profitable? Often, we don’t always know until after the fact. Sometimes profitable solutions are not developed with the intent of making a profit. For example, take the story of a youngster who was having a birthday party. Her father was taking photographs, and the girl wanted to see the pictures now. The father thought: “Well, why can’t she have the pictures now?” That father was Edward Land, and his solution was to invent the Polaroid camera. Perhaps we all need to think more like a child and imagine that we can have that picture now. Zoom ahead a few years and we see that Polaroid is in bankruptcy. They missed the digital revolution because they forgot their innovative spirit. How could this happen? One common way is when the upper echelons of the corporation stifle creativity throughout the organization. Centuries ago, kings and other royalty had “yes-men” by their side. But many kings also employed fools, who had special permission to make fun of and criticize the king’s policies without fear. Present day CEOs have “yes-men,” but they are in dire need of someone to give them an honest opinion, someone who can tell those in the royal boardroom that the old ways are no longer effective and that innovation is how to make money. Creativity goes hand in hand with the courage to embrace the new and innovative. Isn’t it time to think about how you can control your own future? Innovation can occur where you least expect it. Imagine a scientist is trying to produce super-glue. He tries and tries, but the glue just does not stick. His product is a complete disaster. Or is it? Every office in the world now has glue that does not stick. The scientist, who worked at 3M, had just invented the raw material for the PostIt® note. The PostIt note is now one of the most profitable products at 3M. Even Christopher Columbus, one of the great innovators of his time, could not have been much further from his intended destination of India when he discovered America. But that “disaster” became what we now regard as the land of opportunity. So even though the results you get may not be what you expected, continue to think innovatively. Disasters can sometimes become rare opportunities, and unintended results may very well have a positive aspect. Why not have cars washed for your VIP customers while shopping in the store or waiting for the dentist? Why not offer free gift wrap year round? Look around. Ask your customers and employees. Perhaps they have an answer that you never thought of. What do you have to lose? Think everywhere. Think when you are out walking, when you are in the shower, when you are listening to a boring speaker. Switch your mind off and think about that problem that has been bugging you. Don’t bother with contrived brainstorming sessions and working parties, because you cannot plan to create on demand. But you can organize your mind to be constantly receptive to new ideas wherever you happen to be. For example, in 1941, a scientist went hunting with his dog. When he arrived home, he found that wood-burs were stuck to his woolen jacket and trousers. He decided to examine them. Carefully inspecting the burs under a microscope, he found hundreds of little hooks engaging the loops in the material. The scientist, George de Mestral, made a machine to duplicate the hooks and loops in nylon. He called his new product Velcro, and the rest is history. Today thousands of uses for Velcro Fasteners exist, all thanks to a man hunting with his dog in the mountains. The only problem with thinking everywhere is that we often don’t have a way to record our ideas when they come to us. Then, we forget, someone else hits on the same idea, and it’s too late. The solution is to keep a pen and paper handy in every room of the house, especially by your bed and near the shower. When you are driving, use a dictating machine in the car. This way you can archive your thoughts before you forget them. Chance discoveries do not really occur by chance. Rather, an environment must be one that allows new ideas to be conceived, recognized for their potential contribution, expanded into tailor-made solutions, and then finally developed into products for other customers. And the best way to arrive at innovative solutions is to use innovative thinking. Gamblers leave it to luck but we can’t. This is our business and we must think about how we “ante up the bet” to get in the game. What do we do to keep ahead of the best players and more importantly our competition? To that end, encourage your employees to ask questions, such as “Why do we do it this way?” If management does not have a good answer, consider this an invitation for fresh ideas. Nurture the new ideas and welcome the questions as a way to open the channels of communication and keep the stream of possible solutions flowing. Given that genuinely new ideas are hard to come by and very difficult to patent, the shortest route to new ideas can be to get them from someone else. Consequently, be alert to the possibility that others may be listening to the new idea you are sharing with someone. An idle sentence may just provide the missing ingredient to a competitor’s research and development department. Where innovation is concerned, keep quiet and keep your ears open, because you too may obtain problem-solving ideas from other markets or businesses. In your own office, beware of boastful types. A surprising number of people proudly broadcast details of their company’s research and innovation. And, those who leak the most information are usually the most senior. Perhaps one key to successful innovation is skilful ego-massaging. That is, share your ideas, but use caution when choosing who you share them with. Innovation requires more than creative thinking. It is also dependent on the development of ideas into products and services to keep your company on the creative edge. In the end, your determination to succeed is the ultimate stimulus for achievement. Although many people can come up with innovative concepts, only those who are determined to implement those ideas achieve success. Once you nurture your ideas into being, charge ahead with the innovative spirit that all successful companies possess. Remember that innovation combines effort and timing, our desire to be first. Using this approach, your business has every opportunity to achieve success. We offer webinars, public workshops, and private coaching. For more information go to shifthappens for more information and free courses.